Prefer your coffee ice cold? 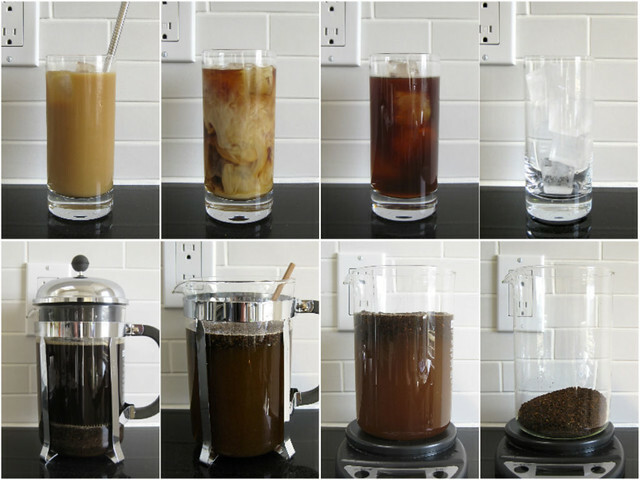 Save some time and energy by brewing it sans boiling water, cold brew-style. Simply stir ground coffee and room temp (or colder) water together, let it sit for about twelve hours — before bedtime, perhaps? — then strain your morning fuel into a cup packed with big cubes of ice. Easy, right? Don’t own a 12-cup French press? No worries. You can hack it with a large pitcher, mesh sieve and, for bonus points and a smoother brew, cheesecloth or a jelly strainer bag. It’s messier, sure, but lets you test the cold brew waters without plunking down a big chunk of change. Is coffee an essential part of your morning routine? What’s your go-to brewing method, or do you leave that to the professionals? Let’s talk in the comments or on Facebook or Twitter! The ratio I use is simple enough to remember, whether you use weight or volume measurements: 2 grams coffee per 1 ounce water OR 1 part coffee to 5 parts water, respectively. Combine coffee and water in the carafe of a 12-cup French press, stir well to ensure grounds are thoroughly hydrated. Cover carafe and set in the fridge or at room temp for 12 hours. After 12 hours, stir mixture then press. Pour coffee over lots of ice and add sugar and cream to taste! Pour any remaining coffee into a pitcher and store in the fridge.